Alexander McCall Smith is on a short list of my favorite authors. I adore his #1 Ladies Detective Agency, 44 Scotland Street, and Corduroy Mansions series, and when I visited Edinburgh a few years ago I made sure to visit 43 Scotland Street (there is no 44) and the Cumberland Bar just around the corner. I was delighted to be in the world of Bertie and all the adults he endures. Smith writes some standalone books too, and for me those have been hit and miss. 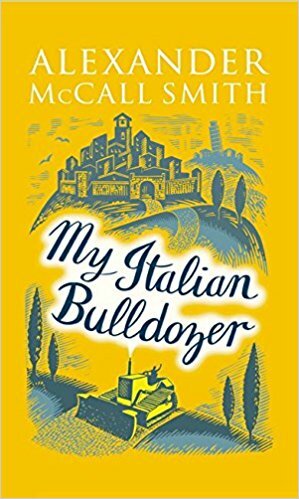 My Italian Bulldozer is not part of a series and would be a wonderful way to introduce yourself to this author if you haven’t already made his acquaintance. The title alone promises humor in a picturesque setting. Paul Stuart is a food and wine writer and his girlfriend of four years has just left him for her personal trainer. Paul’s editor, Gloria, sends him to Italy for personal respite and time to work on his next book featuring Tuscan cuisine. As a result of a rental car snafu, and a short bout in jail, he ends up borrowing a bulldozer. This slows him down considerably but it soon becomes apparent how handy a bulldozer can be in certain situations! 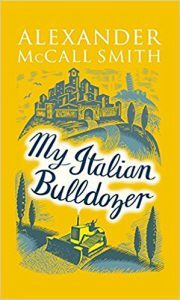 The cast of characters he encounters are the true talent of Smith’s writing: the woman whose car is upended; the man who needs assistance digging a ditch; and anonymous townspeople who “borrow” the bulldozer from its public parking space. This small community is one that keeps track of everything and everyone and Paul quickly becomes a part of the comings and goings. After rescuing the young American college professor in the upended car, there is chemistry between the two writers. Enter the ex-girlfriend, who shows up to apologize in person, with Gloria, the editor, arriving close behind. The events that follow may be predictable but I was more than pleased with the ending. I began thinking that I need to plan to a trip to Italy and wonder if these idyllic adventures really can happen in rural parts of the country as they have in so many of my favorite movies and books. This is a quick read and one that would be perfect to take on vacation, not terribly taxing and satisfying for all the senses.